Over the 2014-2015 academic year, the IwB is partnered with the City of Eastpointe, Michigan as part of its Connecting Divided Places Project, which aimed to understand the networks and interconnected systems that define our cities and their surrounding regions. Eastpointe, along with Toronto and Chicago, are feature cities of this project. As part of this collaboration, the IwB travelled to Eastpointe for a 4-day charrette that encouraged students, faculty and other key stakeholders to reimagine the city’s common spaces. Leveraging existing public spaces, redevelopment sites, infrastructure and resources, this charrette was intended to envision a more livable city. 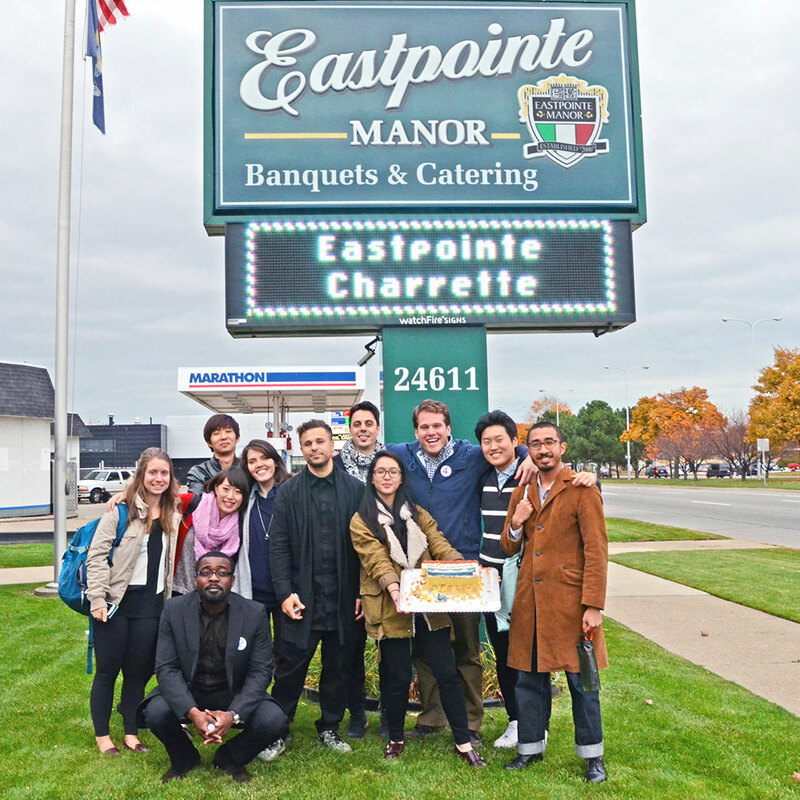 The Eastpointe Charrette was held from October 27th to 29th, 2014, at Eastpointe City Hall. The primary intent of the charrette was to develop tangible ideas and strategies that would activate common spaces within Eastpointe, to increase resiliency, inclusivity and desirability. Working in multi-disciplinary teams, charrette participants created scalable and implementable solutions that are rooted in community-based initiatives and align with existing initiatives and opportunities including Eastpointe’s Place Plan. How do we reimagine the commons to create a contemporary city based on the principles of resilience, inclusivity and desirability? A proposal for “Boxshop,” a temporary storefront made from shipping containers that would serve as pop-up shop and a main street node on Gratiot Ave. The City of Eastpointe is a small, thriving, Michigan suburban community founded on the principles of family values and hard work. It has a vibrant history as a regional connection and access point between Detroit and the Macomb County communities and suburbs. It is also part of the larger international region that links North Michigan and Canada through land and water border crossings. Eastpointe grew and prospered significantly as one of Michigan’s earliest suburban communities. Like many North American suburbs, a major part of the city’s infrastructure was built to promote car use. With the decline of industry in Detroit, Eastpointe experienced population shrinkage throughout the 1970s and 1980s, but has had a leveled population since the 1990s, with only minimal decrease. One of the biggest challenges for the city government is to make better use of the resources that already exist in the community towards future growth opportunities and regional connectedness. Towards these goals, the theme of ‘the commons’ was chosen as the area of investigation for this charrette. The commons are areas within a community or city that are shared amongst its residents. These often provide a platform for creative and political expression, social interaction or leisure, and act as an important connective tissue for citizens. With over 35 percent of land use within Eastpointe dedicated to common spaces, there is a significant opportunity to create a more livable city by generating innovative solutions that take advantage of the existing conditions and infrastructure. Once serving a larger population base, Eastpointe has a generous amount of spaces that could be repurposed to serve changing community needs. This includes roadways, right of ways, public spaces and other core public infrastructure within the city. Four of these types of areas were chosen and were paired with four themes selected in consultation with the City of Eastpointe: 1) Boulevards & Public Space, 2) Redevelopment Sites, 3) The Downtown, and 4) Mobility Hub. Working in teams, charrette participants came up with diverse proposals to develop Eastpointe’s communal spaces that could creating a strong sense of place and belonging, opportunities for entrepreneurship, and economic and social growth in the city. For the charrette, teams were asked to deliver a project manifesto, visualize the proposed site transformation, create either a physical design or service design within the plan, develop a timeline to show how the proposal will unfold and make the proposal adaptable so that it could be replicated for other community projects. The summaries of the charrette teams proposals are available below. A final report was also developed for the City of Eastpointe, which can be accessed here. Eastpointe was designed for auto-oriented transportation. Like many American cities, is left with decades of infrastructure investment that do not address the challenges of the 21st century. The wide right of ways and central medians of prototypical suburban arterial streets provide a spatial opportunity for change. Team 1 was given the challenge of rethinking the use of Eastpointe’s existing network of boulevards around Kelly Rd., JFK Park and Spindler Park. 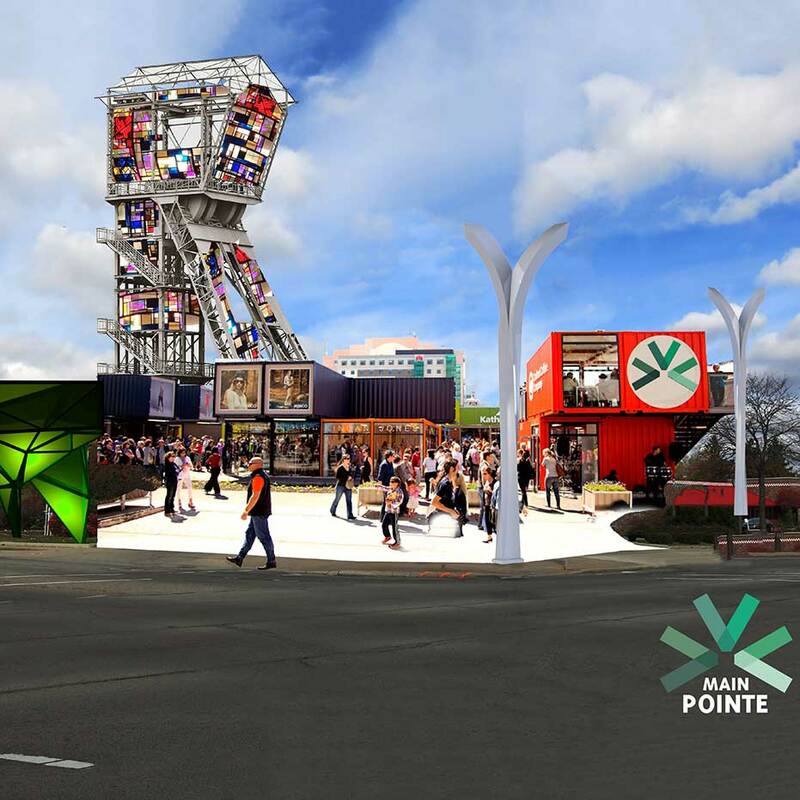 The team was asked to connect and activate these as key public spaces, creating linkages between the larger public space network of Eastpointe and integrating new types of social infrastructure within these common spaces. The team proposed “Park Pointe,” a park that functions as a public, green and community space for families, and individuals of all ages, and is flexible to the diverse needs of Eastpointe residents. Park Pointe can be developed in 3 phases. First as a modular park prototype on the median on Kelly Road, south of Stephens Road, that attracts nearby residents and families, children from the adjacent school, and seniors residing in the equity cooperative housing nearby. In the second and third phase, Park Pointe would be extended south towards 9 Mile Road by adding permanent infrastructure, engaging local community and businesses. Learn more about “Park Pointe.” View the Team 1 charrette presentation proposal. Cities with a past of declining or stagnating population levels find themselves with large tracts of vacant land that provide opportunity for experimentation and development through repurposing, rezoning and community-based master planning. Investment in this vacant lot can be a catalyst for changing the perception of what the city is and what it can become, spurring further economic and social growth. Team 2 was given the challenge of redeveloping the Colonial Dodge site, which is a former car dealership located along the north side of Stephens Rd. that is divided into two portions of land by Gratiot Avenue. The site was recently sold to a private developer and benefits from frontage along the main street of Gratiot Avenue – one of Detroit’s primary radials. The key objectives of this proposal were to create new revenues and financially sustainable redevelopment for the City of Eastpointe. Team 2 proposed a mixed-use development within the existing Colonial Dodge site that makes a new point of interaction in Eastpointe called “The Pointe.” The goals of the proposed new space were to create a flexible space at the Colonial Dodge site that can showcase various events, provide new housing through the creation of three pocket neighbourhoods with garden homes and design infill for the main street with live-work lofts. Team 2 envisions The Pointe as a live, craft, sell, connect, teach, grow, play and reflect community village with business, education and not for profits. Learn more about “The Pointe.” View the charrette presentation proposal. Walkable environments, mixed-use buildings and programmed activities are extremely important to the development of Eastpointe. The main street of Eastpointe has traditionally run along Gratiot Ave. where there is a combination of commercial, light industrial, educational and public uses that are situated along this boulevard. While there is no distinct primary node, the intersection of 9th Mile and Gratiot Ave. is one of the primary intersections within the city boundaries and provides an opportunity for change. Inspired by Eastpointe’s rich agricultural history, the team referenced the idea of the old ribbon farms built along the city’s waterway, as a way to repurpose, expand and make use of the median strip located in between Gratiot Ave., Couzens Ave. and Aurora Ave. The goal of the project was to create a pedestrian-friendly zone that promotes present and future social, intergenerational connection. The team reimagined this area as a communal space for attraction and commercial development. Included in the proposal were several interventions like the “Boxshop,” a temporary storefront made from shipping containers that would serve as pop-up shop, “The Orchard & Ribbon Canopy,” a new space for green expression, and the “Town Square,” a new design for a central Eastpointe meeting place for all community residents and tourists. Learn more about “Main Pointe.” View the charrette presentation proposal. Mobility hubs are spaces of connection and intermodal exchange, acting as the origin, destination and transfer point. They are intended to facilitate the most efficient, sustainable journey to and from destinations, but must also address community needs to accommodate last-mile journey patterns. They can spur an increase in residential density and commercial activity, and typically require a critical mass of users to be successful. Successful mobility hubs align with concentrations of development, community needs and services, offering new local and regional connections that enhance quality of life and improve commute times. Team 4 was given the task of establishing a new transportation hub at the northeast corner of 8th Mile and Gratiot Ave. The site currently accommodates a variety of uses including a commercial strip mall, gas station, fast-food restaurants, and a vacant former commercial building. It also has an abundance of parking space that is typically underutilized. The proposed future hub was to addresses the changing community needs and enhance local and regional mobility. Taking advantage of the high traffic location and existing transit connections to the site, team 4 proposed a mobility hub concept that aspires to become an intersection point for Eastpointe and the surrounding communities, bringing together people of all ages and backgrounds. Learn more about “Opportunity Hub Eight.” View the charrette presentation proposal here.